New background and weird "bugs"
Google came up with some new backgrounds. I liked this one, it fits my theme better! I hope my readers like it too! I had an interesting "bug" night on the carport last night. I turned on the black light around 9 p.m. and waited for the moths and other insects to arrive. It started out a bit slow, I don't think they like the damp weather any more than we do. I found a few new, pretty moths. This one is a Little Nymph Underwing. They look very different when they have their wings closed. 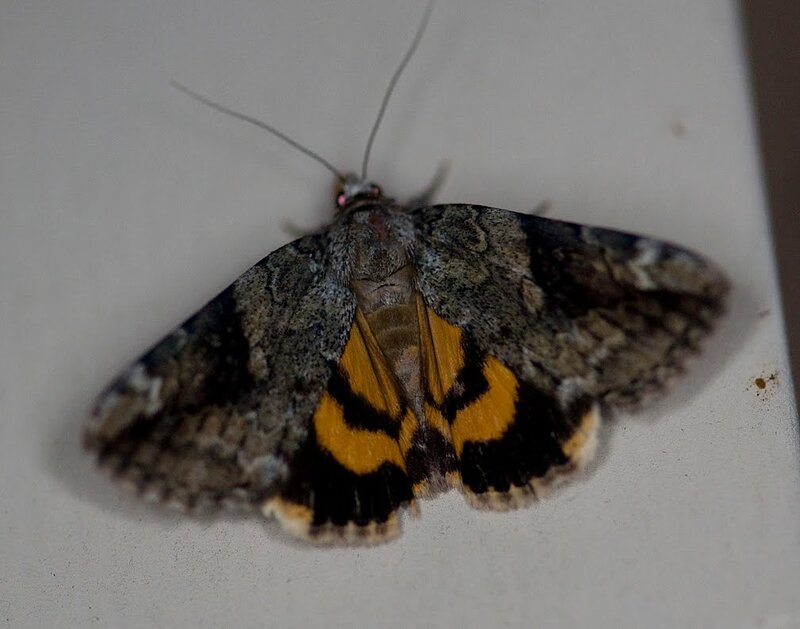 I took this photo standing on a stepstool because the moth was on the ceiling of the carport! 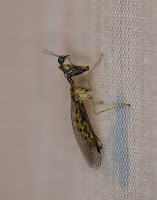 The strange-critter-of-the-evening award had to go to the Mantisfly! 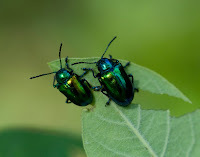 I had seen thes e insects in books, but never in real-life. It took a while, but I finally coaxed it onto the sheet, it had been on the ceiling near the porch light. 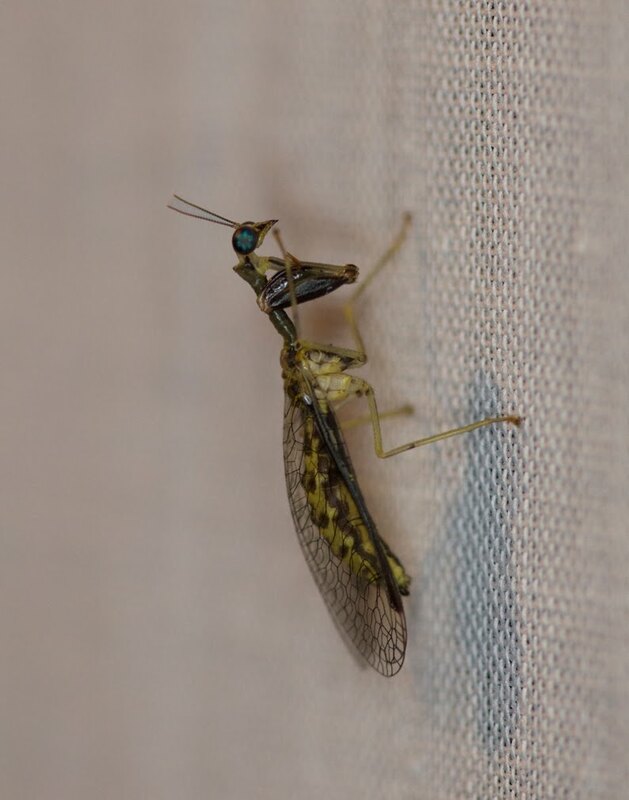 What an unusual insect! 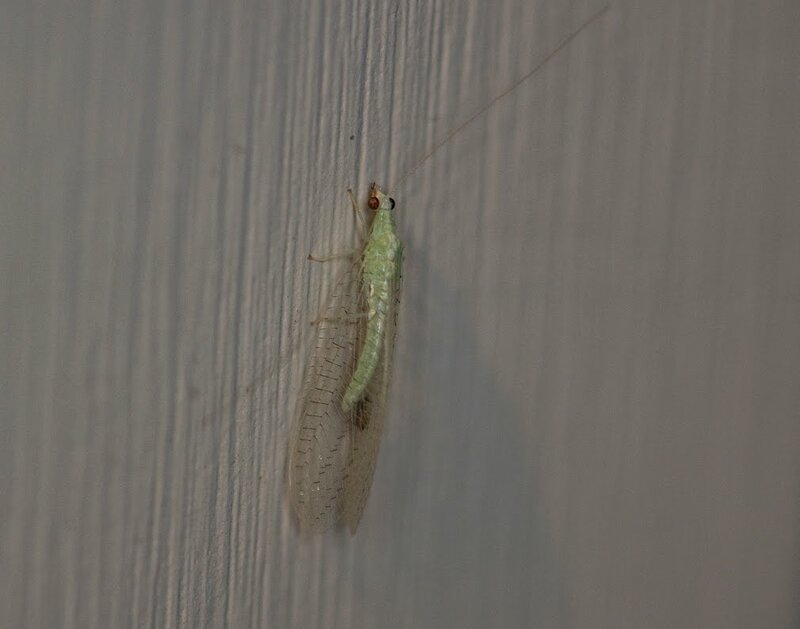 It really did look like a small Praying Mantis with its odd legs! 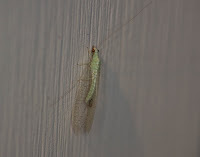 To round out the night, I found a pretty Green Lacewing on the wall. 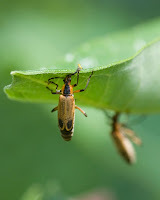 These are very benefic ial insects, they eat many other insects during their lifetime. On Monday my friend Laura and I headed over to Ijams Nature Center to do some photography. We met in a Photoshop class in Knoxville a few months ago and have been wanting to get together. It turned out to be a gorgeous day and we saw lots of nice insects. 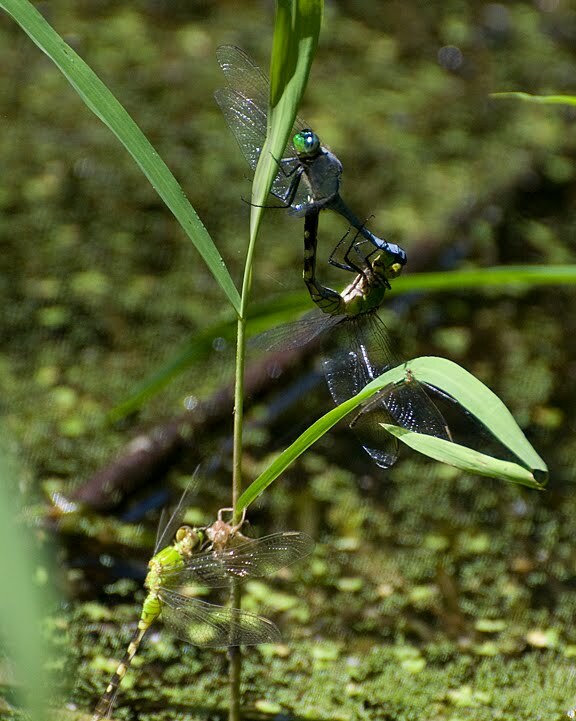 The dragonflies were spectacular! 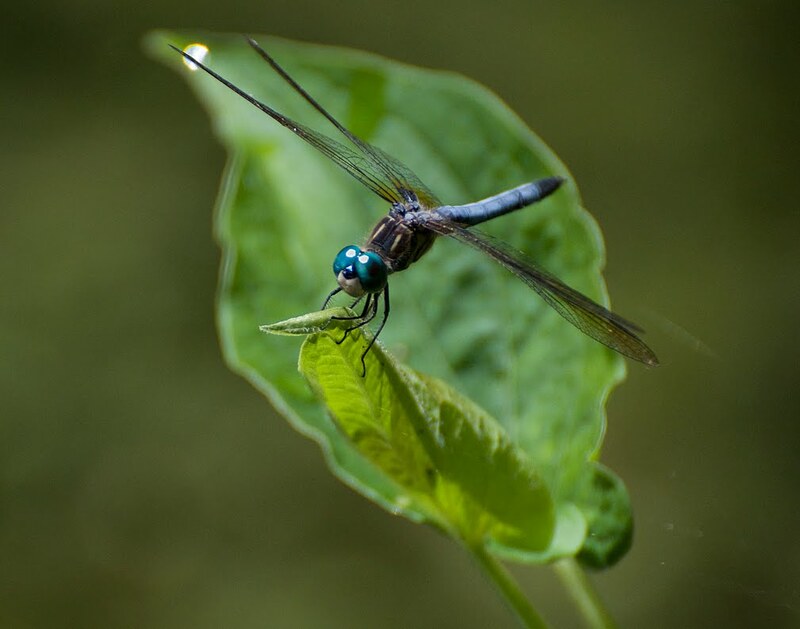 I like the Eastern Pondhawk with the big green eyes! 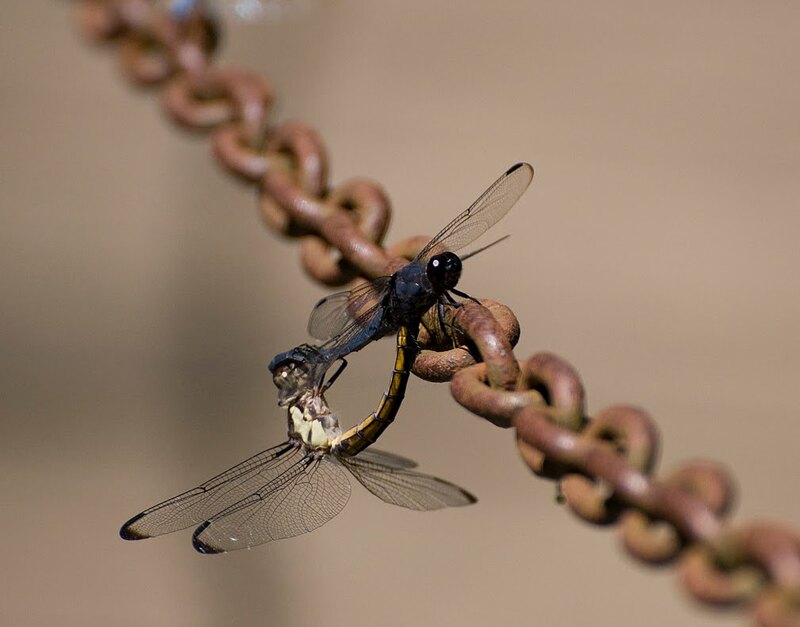 Spring is still in the air, so many of the dragonflies have "love" on their minds! I caught this pair "in action", I didn't notice the female that had just molted below them until I looked at this photo on my computer! I often get surprises like that! While I'm on the subject of dragonfly "love", I'll post this photo of the Slaty Skimmers mating on a chain. Notice how the male (dark blue) grasps the female's head and she hangs on to the end of his abdomen, . She then inserts her abdomen into a special area where he deposited his "fluids," (I have to keep this family-friendly!) this is called the "wheel position". Within a few seconds after mating, she began to deposit her eggs by dipping the end of her abdomen in the water. 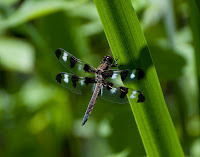 I was thrilled to see a gorgeous female 12-spotted Skimmer dragonfly when she landed on a cattail leaf. I never saw a male of that species, he would have been even more spectacular! Two little boys noticed a tiny Peeper Frog sitting in the middle of an Arrowhead leaf while we were at the pond. I love seeing small children get excited about seeing things in nature! They also saw a large brown spider with babies on her back. It gives me hope that at least a few of the members of the upcoming generation will have an appreciation of nature and understand the importance of protecting it! As Laura and I walked in the garden I noticed a large insect land on a leaf. It turned out to be a large Robber Fly with a Japanese Beetle in its mouth! They are intimidating-looking insects, but they are very helpful predators of "bad" bugs! 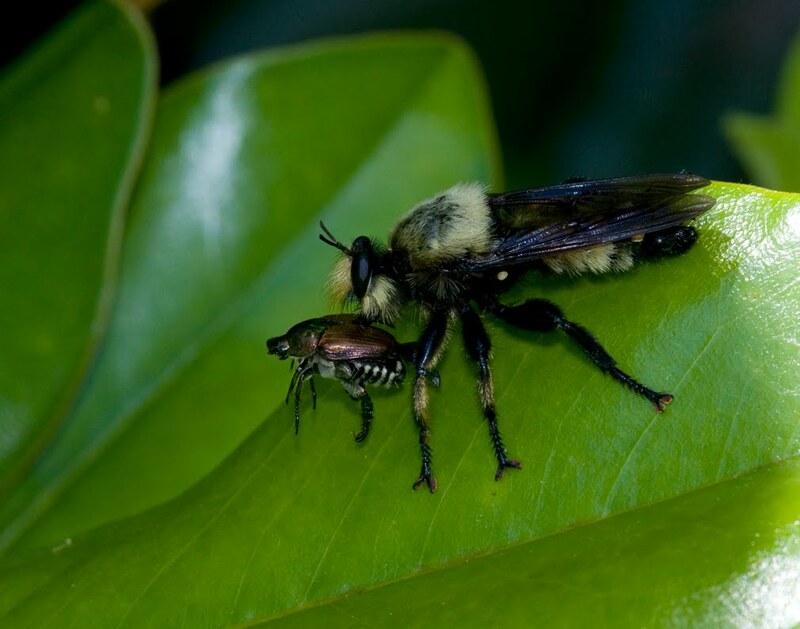 They look a lot like a bumblebee at first glance because of their fuzzy yellow and black body. 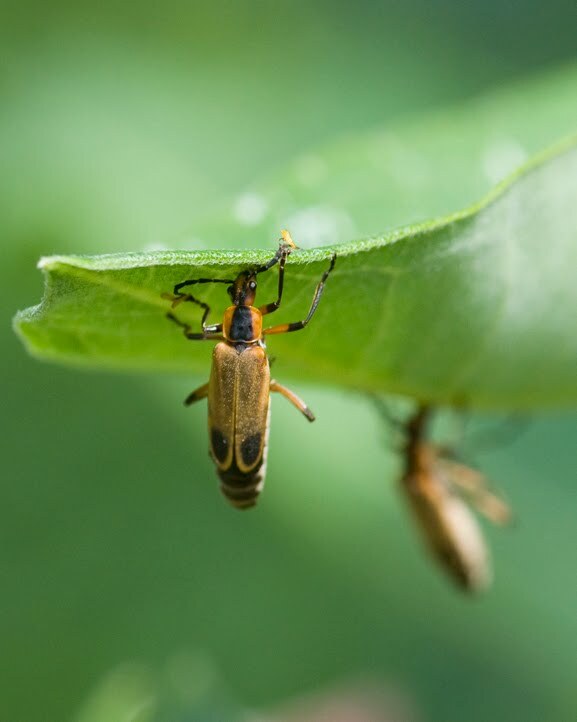 On the subject of beetles, Soldier Beetles are not the " sharpest tacks in the insect box", so they don't know better than to try and eat milkweed leaves. Common Milkweed has latex in the sap which gums up the beetle's mouth if it bites into a leaf vein. 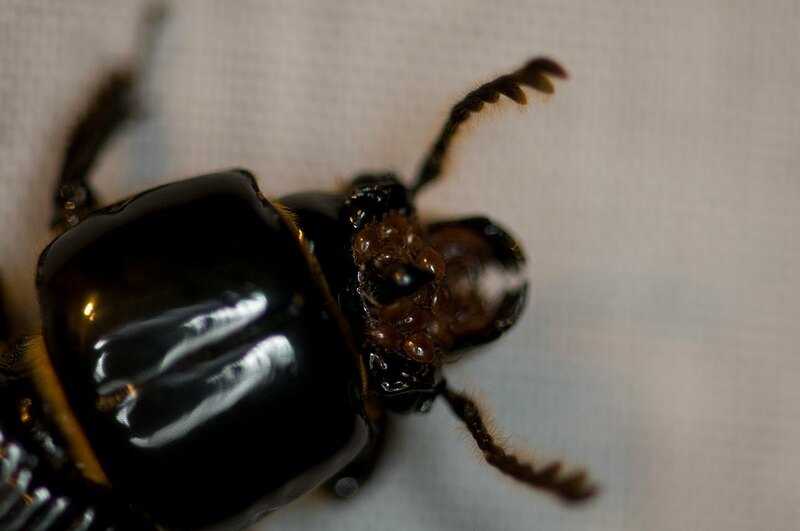 Here is a photo of a dead beetle hanging from a leaf. Maybe it didn't listen to its mother when she told it not to chew too much gum! Ha!